This is the fifth bombing this month. A PACKAGE EXPLODED this morning at a FedEx distribution facility in Texas, news reports said, two days after the latest in a series of blasts in Austin attributed to a serial bomber. This time the explosion rocked a facility in the town of Schertz, in the San Antonio area. Reports said one employee was injured. 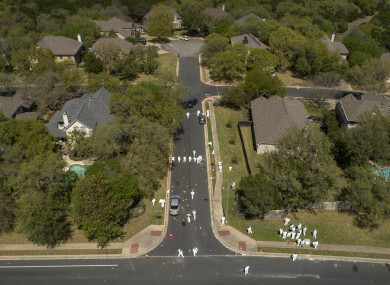 The Washington Post, quoting the FBI, reported that the package had been bound for Austin, the state capital. Hundreds of police officers and FBI agents are searching for a mysterious “serial bomber” after Sunday’s blast in Austin, the fourth this month, left two young men seriously injured and the city on edge. Police said the explosion was connected to three previous bombings in Austin and the bomber used a tripwire in the latest attack, showing a higher level of skill. “We’re clearly dealing with what we expect to be a serial bomber at this point,” Austin police chief Brian Manley told reporters. But Manley said police have been unable to determine a motive for the bombings that have killed two people in the city of nearly one million people and injured another four. In the earlier bombings, two African American men were killed by packages left on their doorsteps, raising the possibility of a racially motivated crime. A 75-year-old Hispanic woman was also injured in a blast. But Manley said the bombing on Sunday seriously wounded two white men aged 22 and 23 as they walked along a sidewalk or on the road in a quiet residential neighbourhood. The police officer appealed to the bomber to contact the authorities and to the public to report anything suspicious. An exploding package killed 39-year-old Anthony House on 2 March. A 17-year-old African American teenager, Draylen Mason, was killed on 12 March and the Hispanic woman was critically injured the same day. A task force of hundreds of members of law enforcement are working the case, including criminal profilers and experts from the Federal Bureau of Investigation and the Bureau of Alcohol, Tobacco and Firearms (ATF). Email “'We're clearly dealing with a serial bomber': Another parcel blast reported in Texas”. Feedback on “'We're clearly dealing with a serial bomber': Another parcel blast reported in Texas”.